ISOFLEX combines four proprietary delivery systems. The ingredients in each system work synergistically to provide a high quality and great tasting protein powder that's been designed to help you reach your goals. With 7 critical cofactors in 4 proprietary complexes, ISOFLEX not only provides an ultra pure, highly bioavailable whey protein isolate but a potent delivery system to ensure powerful nutrient assimilation you can feel. What is whey and why is it so valued as the core foundation of every serious performance nutrition program? Whey is a thin, watery portion of milk chockfull of high-grade protein that’s separated during cheese production. It is extracted through a two-step process. The type of extraction conducted to separate whey from milk is what really determines the quality of whey protein. It’s this exact process that also sets ISOFLEX protein powder apart from others on the market. Other whey processing technologies use higher temperatures that cause irreversible unfolding of the protein fractions that can drastically reduce the biological activity of the protein. Based on solubility at a pH of 4.6, ISOFLEX has a mere 3% denatured proteins, which is approximately 10% less than ion-exchange whey protein isolates and typically less than other microfiltration whey protein isolates. 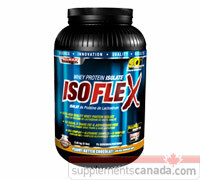 ISOFLEX also contains up to 12 times more native GMP than ion-exchange whey protein isolates. ISOFLEX is manufactured in the US with US Dairy Cows. ALLMAX protein products contain absolutely zero protein sourced from China. Every lot of ALLMAX proteins are tested for heavy metals. No lot is ever released if it does not pass these tests. 4. IS Complex (Rapid Absorption™): Alpha Lipoic Acid (ALA), d-Pinitol and 4-Hydroxylsoleucine. Designed to increase protein uptake and support insulin.